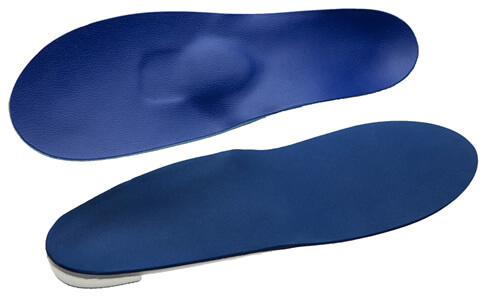 Metatarsalgia | Marathon Orthotics, Inc.
To ease the pain of Metatarsalgia, add plenty of cushion. This entails adding as much cushion under the met heads as the shoe will allow. Most shoes with the insole removed can comfortably take 3/16” thickness without making the shoe tight. Top Cover II has the cushion needed and still fits in the shoe. However, if it is a particular met head or two that are the real problem, we suggest top cover F. This is a 1/8” Spenco/Neoprene cushion against the foot with a 1/8” firm Pelite forefoot extension that can accommodate cut outs. The Pelite holds the cut-out well, making it quite effective. Check Cut-Outs in the Accommodations section of the prescription order form and mark the cut-out on the cast. Accurately circle the area needing the cut-out on the foot diagram on the prescription order form. Note: A Medium height met pad may also be added.